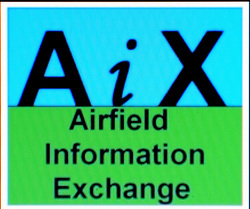 The Airfield Information Exchange (AiX) was created in April 2008 by Noel Ryan, Richard Flagg and Chris Percy. The three airfield researchers and photographers had for some time been looking for a way to centralise the contacts they had each built up over the preceding years as a vehicle for sharing information amongst fellow researchers.The most obvious way of doing this was to create an internet based discussion forum and the initial framework of this was created by Noel in early April 2008. Richard and Chris were made administrators and over the next few days the basic form of AiX was created. The viability figure of members perceived was just 50, but this was reached and passed fairly quickly indicating that we had found a hole in the market and consequently membership grew rapidly. Later that year the forum moved platforms to a more stable subscription system from the early free hosted version resulting in far superior performance. The system administration is now carried out by an IT professional who is also an ARG member. Membership of the forum is diverse. Many well known names in the military research world, including authors and noted experts in their own particular field have been brought together. Forum membership also includes individuals / representatives of interest groups (museums, collections, for example), those with an interest in a particular site or specific interest and those who want to learn from others about military architecture and history.